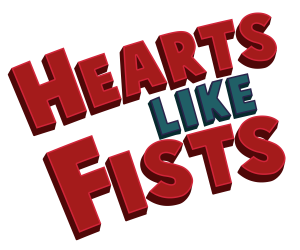 THE STORY: Hearts Like Fists is a superhero noir comedy about the dangers of love. The city’s heart beats with fear: Doctor X is sneaking into apartments and injecting lovers with a lethal poison. Lisa’s heart beats with hope: now that she’s joined the elite Crimefighters, maybe she can live a life with meaning. And every beat of Peter’s wounded heart brings him closer to death, but he’s designing an artificial replacement that will never break. Can the Crimefighters stop Doctor X? Do Peter and Lisa have a chance at love? And who is the girl with a face like a plate? Fun Fact: I will tell you nothing about myself. Fun Fact: A track star in college. Could have gone all the way but then crime called and she answered with justice. Fun Fact: Was arrested a lot for assault before becoming a Crimefighter. Like A LOT. Fun Fact: Surgery is like riding a bicycle. You never forget. Even if you have brain damage. . . I’m pretty sure. A crimestopper who the Crimefighters are trying to recruit. Dislikes: Breaking hearts, but what can you do? unFun Fact: Her father died during brain surgery. unFun Fact: His heart’s been broken a lot.